This use of foam board is simple. A low-cost reusable chalkboard for adding an interactive element to your temporary exhibitions. I created this chalkboard for the extremely low budget Lost Collections of the Ancient World exhibit. One of the central objects in the exhibit was a large clay pot full of perforations, the “Mystery Vessel,” so named because we did not know the original intended purpose of this pot. 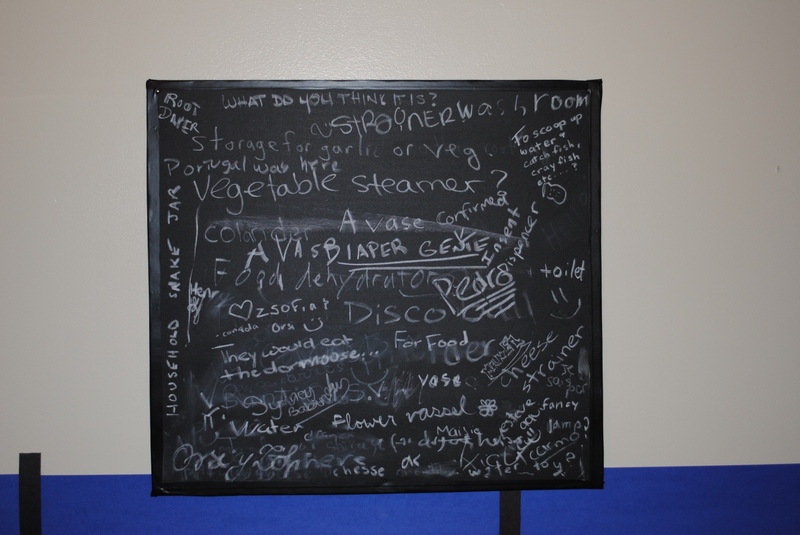 So, we asked exhibit visitors to write what they thought it might be on the chalkboard. This helped add an evolving and interactive component to the exhibit. The chalk can be removed just like from a regular board. You can of course paint chalkboard paint directly onto a wall, but the foam board ‘s light weight and portability allow it to be easily hung and re-hung in different locations throughout the museum and exhibits. Step 3: Use the finishing nails, one at each corner (plus one more along the middle of each edge – if making a large chalkboard) by gently taping in the finishing nails – this takes practice, you don’t want to hit the foam board with your hammer – It will dent! Further suggestion: Do you want to have a full wall chalkboard without the permanency? Try painting multiple foam boards and puzzling them together on the wall.